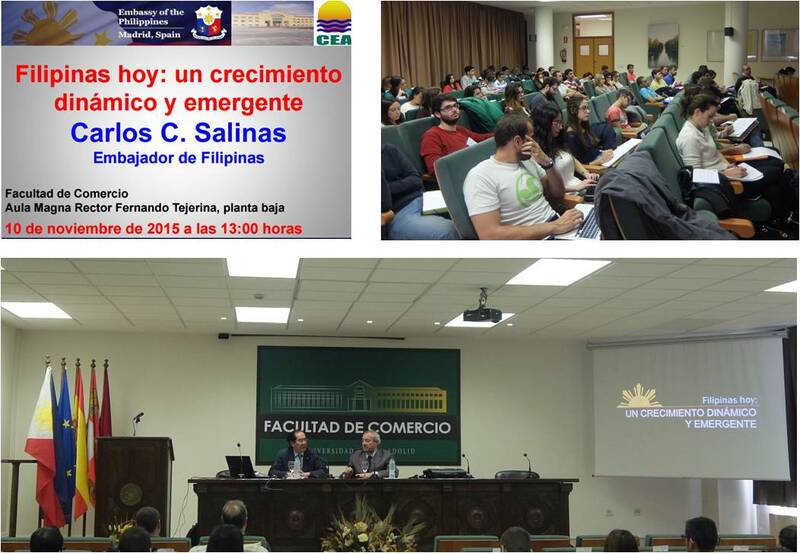 The Philippine Embassy in Madrid, in collaboration with the University of Valladolid, organized a seminar entitled “The Philippines: a dynamic and an emerging economy” on 10 November 2015 at the University of Valladolid. The seminar was part of the 10th Series of Conference on Australasian economies and societies conducted by the Asian Studies Center of the University of Valladolid. The audience was composed of the professors and students of Commerce and Masteral degree in International Trade of the said university. Ambassador Salinas delivered a presentation that highlighted the developments in the Philippine economy, the status of Philippine-Spanish bilateral trade relations and the role of the Philippines in the ASEAN Economic Community. Prior to the presentation, the Ambassador made a visit to the Biblióteca Histórica and met with the Rector of the university, Mr. Daniel Miguel San José.